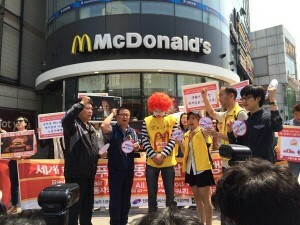 The fast-food workers’ uprising that began 18 months ago has expanded to become a global salvo against inequality, with workers striking in 33 countries on May 15. Fast-food CEOs are paid 1,200 times as much as workers in that industry. That’s more than four times the amount of CEO-to-worker inequality in the U.S. economy as a whole, which already has an outrageous level of pay disparity. It is easy to see pay disparity as an issue of economic fairness, but less intuitive to see it as a health issue. But, countries that have more economic inequality have been shown to have worse health outcomes and more social problems than countries with greater equality. For example, populations in more unequal countries experience lower life expectancy, higher infant mortality, more mental illness, and higher rates of homicide and incarceration. The United States fares particularly poorly on these measures, a sad outlier in every graph that makes comparisons across the industrialized world. Researchers like the UK’s Richard Wilkinson have shown that when countries are more equal, they not only experience better health outcomes at the bottom of society, but at the top of society, as well. Yes, the benefits are greater for those at the bottom, but everyone benefits. So, I could look at the fast-food uprising and say it’s not my fight. After all, I rarely eat fast food and I’m not a low-wage worker. But, if I take a big-picture view of it – informed by the work of Wilkinson, et al. – I can see that the strikes could potentially benefit all of us, by contributing to the creation of a more equal and, thus, more healthy society. Because it has so many workers making wages that place them below the poverty level, the United States has a category of people it calls the “working poor.” This is one side of the inequality coin. On the other side, “CEO compensation has grown far faster than the stock market or the productivity of the economy” over the last several decades, according to the Economic Policy Institute. In fact, CEO compensation went up 875 percent between 1978 and 2012. The typical worker’s pay went up only 5.4 percent during the same period. Workers are doing their part to address disparity from the bottom up, risking their jobs by speaking out publicly when they do not have a union to protect them. In fact, one of the things they are seeking is the right to unionize without fear of retaliation from their employers. The strikers’ rhetoric stresses fairness and greater equality, but it could just as legitimately stress the benefits to their health of a higher wage and greater job security. Meanwhile, we should all be rooting for the fast-food workers’ success – for their health, and ours.